Happy New Year! What better way to start the New Year then batch cooking and prepping for the week ahead. 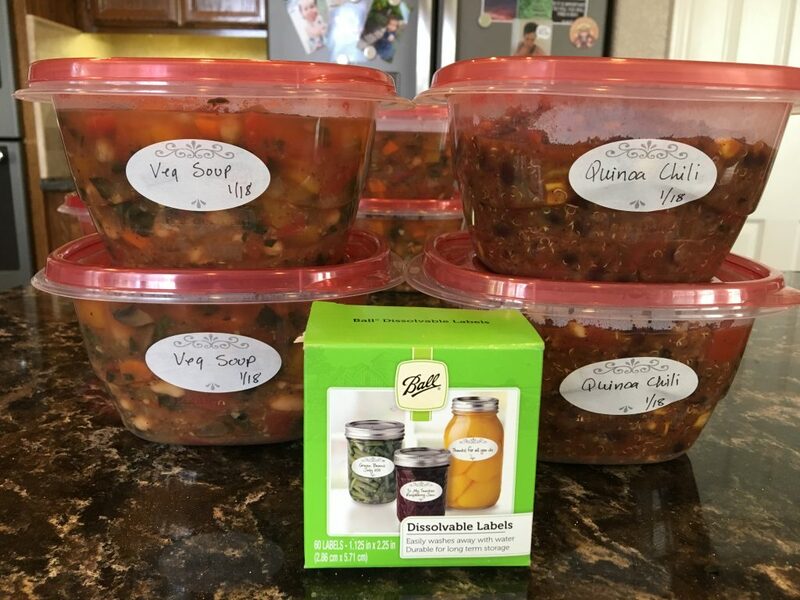 Since adopting a whole food plant based diet – WFPB – I have found that batch cooking makes my life so much easier. Once a week I spend 4-5 hours cooking and prepping food that we can then reheat and eat the rest of the week. We mix and match things from the fridge and come up with all kinds of combinations that are quite satisfying and filling. Perhaps you will find batch cooking simplifies your life as well. 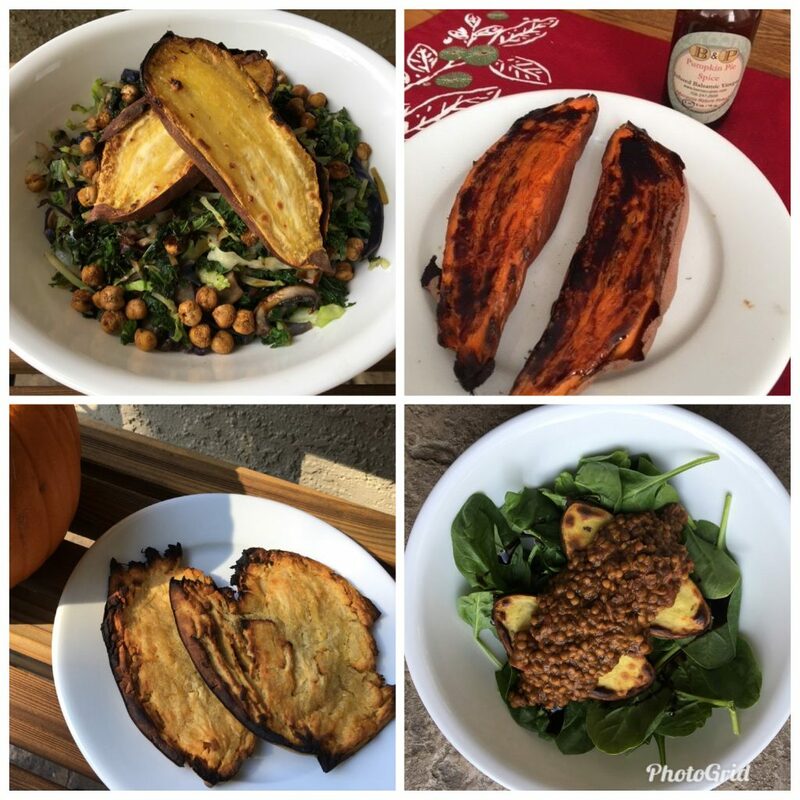 Top left is Quinoa Butternut Squash Chili, in the red pot is Winter Vegetable Soup, these can be served in different ways like over a baked potato, a sweet potato, over brown rice, wild rice or cooked oat groats and they can be topped with cooked greens. Corn on the cob cooked in the Breville Air Fryer, eaten as is or cut off the cob and added to my Big Beautiful Salads – 7 salads to go in the fridge and one for my lunch today. Tom and I really enjoy the Chopped Salads these days – they are so filling and flavorful. You can come up with so many different combinations you will never get bored with your salad. Japanese sweet potatoes, Yukon Gold potatoes, Sweet Potatoes and a few Hannah Yams all oven roasted in the oven at 400 degrees for 1 hour and 20 minutes. We prefer all of our sweet potatoes cooked this way as they become really sweet and delicious! These can be eaten by themselves, as snacks or topped with various soups, beans and greens or cut up and added to salads or with quinoa and veggies for a meal. Take a sweet potato – any kind that is already oven roasted cut in half and warm it in the air fryer at 400 degrees for 20 minutes. It gets all crispy on the outside and all warm on the inside – sprinkle with a little ground cinnamon and a drizzle of a flavored vinegar like Pumpkin Spice or Maple – that is dessert. Sometimes I cut a cold oven roasted Japanese sweet potato in half and flatten it using my hand, then air fry it for 20 minutes at 400 degrees. It is so delicious this way! The photo on the lower right is a Japanese Sweet Potato on a bed of spinach topped with BBQ Lentils over the top. Take any of the precooked potatoes and cut them into fry shapes and fry them in the air fryer for 20 minutes at 400 degrees – best fries ever! Air fried potato chunks or fries are scrumptious in a Burrito Bowl or a Nourish Bowl in place of rice. One of my quick and easy meals is a Mexican Stuffed Potato. In the casserole dish I had some yellow squash that needed to be cooked so I sliced it and added some little tomatoes, mushrooms, fresh garlic cloves and chopped red bell pepper roasted in the Breville Smart Oven Air on the roast setting for 35 minutes at 350 degrees. It can be veggies for breakfast, served over brown rice, quinoa or a topping for a baked potato, yummy on top of my salad too. I like to use containers that I can see through so when we open the fridge we can see what ingredients we have to make a meal out of. I have purchased two sets of the Glass Containers with Snapware Lids. I use the Rubbermaid BPA Free Plastic Containers to freeze soup, stew, chili, rice and other items. 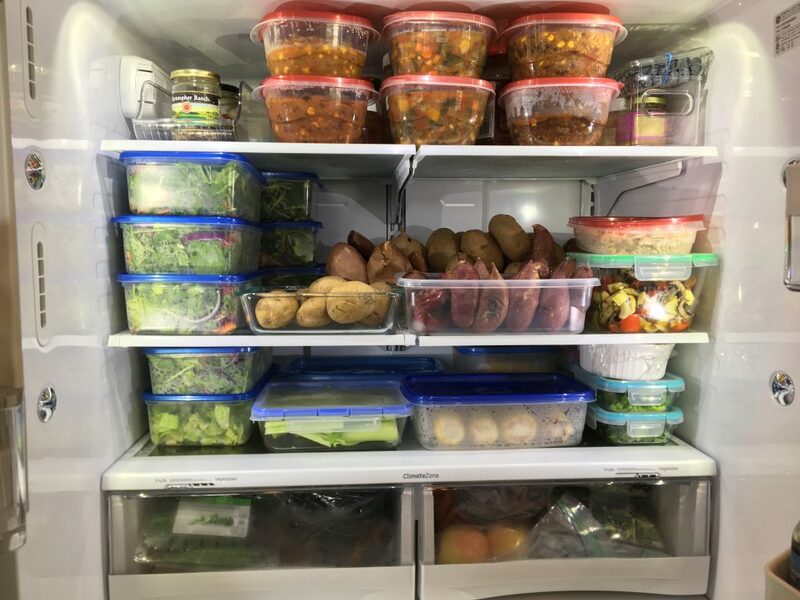 Our one pound salads fit nicely in the Ziploc 9 cup containers and they stack nicely in the fridge which makes storage easier. We store all of our cooked potatoes in the fridge in open containers and stand them on end so they don’t get smashed. They last a good 7-10 days this way. These containers each contain 4 cups of stew, chili, soup or marinara sauce, broth or whatever we have extra of that needs to be frozen. I buy these Ball Dissolvable Labels so we know what’s in them and the date they were made. The containers stack and hold up well. I don’t put them in the dishwasher – I had wash them and the labels do dissolve easily. 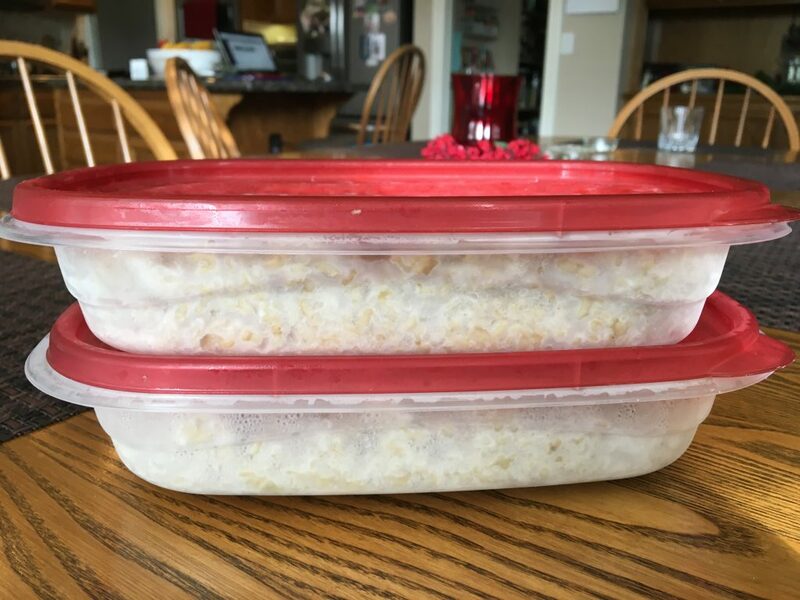 We make a large batch of brown rice in our rice cooker then divide it up into containers and freeze it. It’s a big time saver. For rice we prefer the 4 cup rectangular containers. If we forget to thaw out rice you can still break off a chunk of it frozen and thaw it out in the microwave easily. This is what the fridge looks like after batch cooking is complete. I love opening the fridge and seeing all this food ready to heat and eat! It keeps us on track and we don’t have to worry about what’s for lunch or dinner. I almost always have a salad for my lunch – it’s simple, easy and quick because I have it already to go. I do make salads twice a week – the prepped ones are good for 3-4 days. For dinner we will have a starch, greens, a soup, chili, lentils or beans. Fruit for dessert, raw veggies, a potato or fruit for a snack if we are hungry. This is one shelf of our big freezer in the garage. 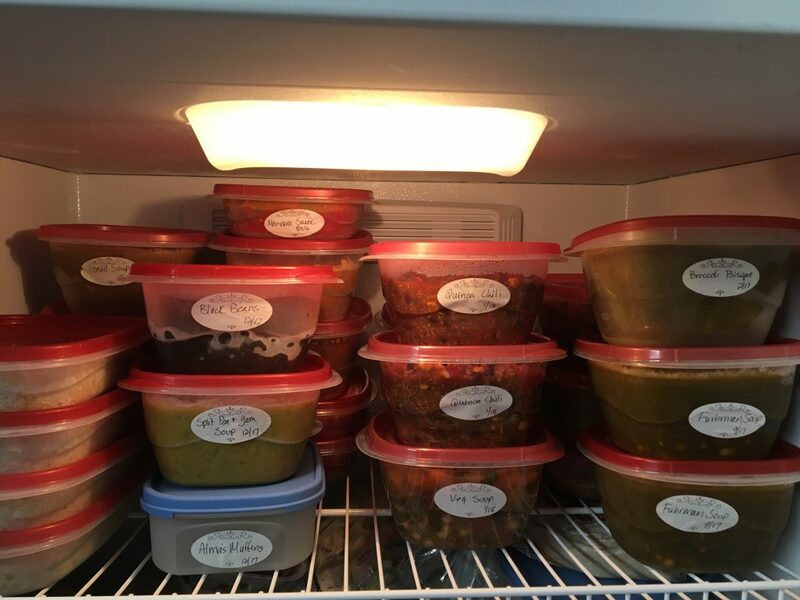 Every week when I batch cook some of the soup, stew, chili or whatever I make goes in the freezer. This way we don’t have to eat the same thing for days on end. It also gives us such a nice variety to choose from. Sometimes Tom and I don’t want the same thing and this way we can each have what we want! Even if we don’t have time to cook or one of us gets sick we still have healthy food on hand to heat and eat. In addition to my usual batch cooking during the week as needed I will make Donna’s Cheeze Sauce, Creamy Balsamic Dressing, ketchup, quinoa, wild rice, veggie burgers, lentil loaf, Chef AJ’s Millet Oat Muffins or her CRAM Muffins and prep fresh fruit or raw veggies for snacking. If you don’t have a 4-5 hours window of time you can still batch cook. Every time you make an entree like veggie burgers, lentil loaf, soup, stew or chili make a double batch and freeze it. When I make veggie burgers I will make 24 at a time and those might last us 2-3 months. It doesn’t take much longer to make a double batch than it does a single batch and I only have to clean up the kitchen that one time but I get twice as much food for the effort. If you always make extra pretty soon you will have a nice variety of food prepped ahead. In the evening while before you start prepping dinner perhaps you can put a tray or two of potatoes in the oven to bake. One day a week could you make a double batch of chili and freeze some? If you make hummus make a double batch and freeze one. yes hummus freezes really well. Start thinking about how you can save time in the kitchen by working smarter not harder. I have read that most people have about 10-12 meals that they rotate on a regular basis. When I think back to when I was raising my kids that surely was the case. Today even though we are following a plant based lifestyle that is still true. Now every once in a while I do try a new recipe that gets tossed into the rotation but we still enjoy a fairly simple day to day menu. I find myself making the same recipes over and over because we like the food we eat! Through out the course of the day we have to continually make decisions, it starts when the alarm goes off and we decide if we are getting up right then or not. We decide what to wear, what to eat for breakfast, what to feed the kids, what to make for their school lunch and on and on it goes through out the day. By the time you get done with work and get back home you are tired and hungry. Often times people say they do really well on their food plan all day long but by evening they blow it. There is something called decision fatigue. After having to make decisions all day long your brain is tired, your resolve gets thin and your will power is diminished. Even the simple task of making dinner may feel overwhelming. If you batch cook ahead at least you don’t have to worry about what you are going to eat. If healthy food is readily available guess what you will eat – yes healthy food! That old saying “fail to plan, plan to fail” is true. I have added a Batch Cooking tab in the recipe files and will be putting all the batch cooking blog posts there so they are easier to find. Click on the Recipe tab at the top of this page, click on Plant Strong Recipes, under Cooking Method you will see Batch Cooking. I now have an Amazon Recommendations Page! It has the items on it that I use and I will be adding items to it as I discover new things that make this lifestyle easier. When you purchased Amazon items through my links you help support my work here without any extra cost to you. If you want to find the link in the future just click on the Shop tab at the top of this page. Thank you for your support. I hope that this post was helpful and will get you started thinking about how you can incorporate batch cooking into your life. Great info. I do batch prep for one!) and when I was working full time, cooked on the weekends. My biggest problem is not having great success with freezing, will get some of your containers. Thanks for post. Hi Bonnie, I hope the new containers will help you with freezing success! So far these containers are working well for me. Wow!! Thank you for this fabulous post. I love reading and seeing photos of what/how other people cook and organize. 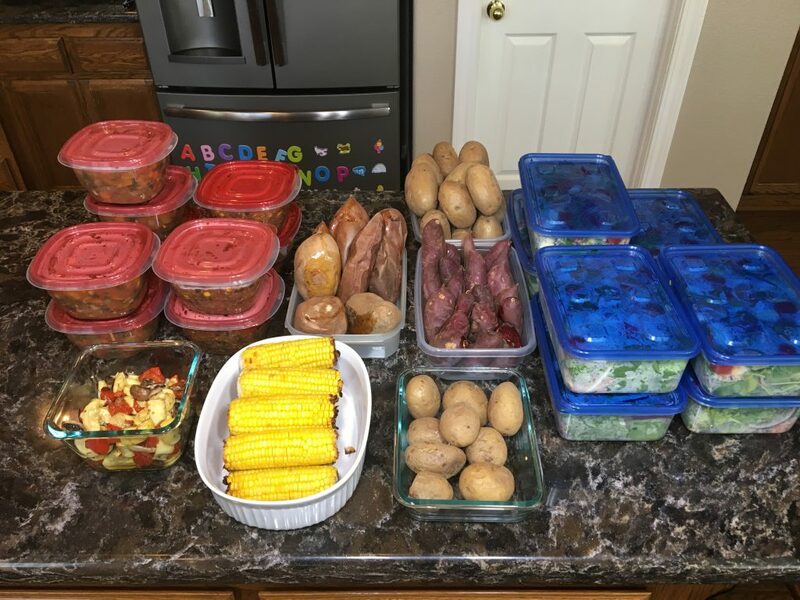 You have inspired me to do more batch cooking. Your refrigerator/freezer looks beautiful and organized. OMG you are so organized. Thanks for sharing. You are an inspiration! Thank you it really does make life easier! Thank you for this post. Your always very helpful. Now if I would just put this all to practice. I hope you will try batch cooking! It frees you up the rest of the week. Wow! I’m very impressed with your production. Your refrigerator looks organized and beautiful. Please keep these inspirational posts coming. I’m making the winter soup tomorrow and I think that I may “need” some of those freezer storage containers and labels. Thank you so much! I hope you love the Winter Vegetable Soup as much as we do. Wow!!! Getting better at batch cooking is one of my goals for 2018! Thank you for the inspiration! No excuse not to do it with the bitter cold here in Massachusetts. How is your batch cooking going? Stay warm there in Massachusetts. What time do you have your first meal? Do you wait until you are hungry like chef AJ suggests or do you normally eat breakfast? if so what is it?! thanks!! I wait until I am hungry to eat breakfast and that is usually between 10:00 -1:00. I might have steamed veggies or if it is later I will go ahead and have one of my chopped salads or the big beautiful salad. This batch cooking is really going to help us stay on track. We’re both retired so batch cooking is very doable. Is your batch cooking for 2 or 4 People? Or none of the above! I just look at quantities and wonder of 2 can eat all of that in 10 – 14 days. 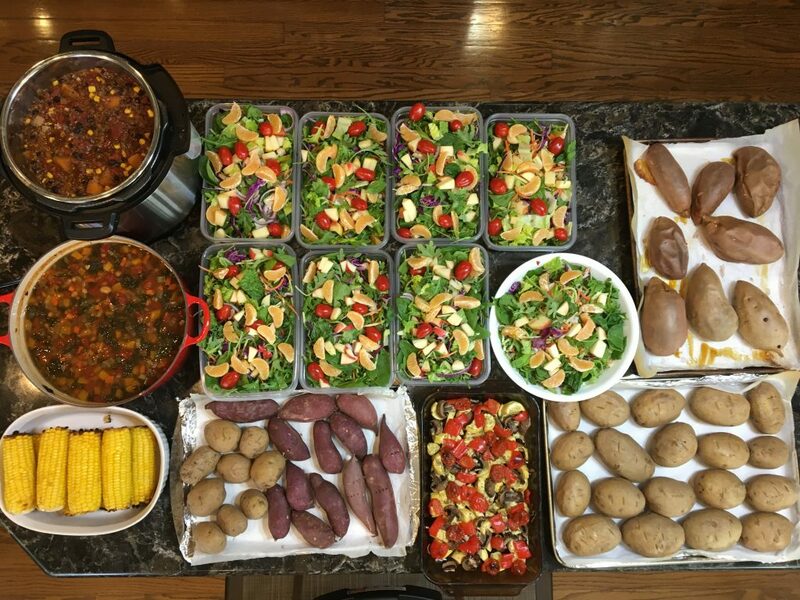 Hi Tara, we are cooking for two adults who eat a whole food plant based diet – we eat pretty large portions!We actually eat most of it up in about a week. The salads only last for 3-4 days! Just adjust the quantities to fit your needs. It doesn’t take long to figure out how much you need for a week. It is such a time saver. Happy Cooking! This is a wonderful post. The pictures are so motivational! Thanks for posting this! Thank you for the kind comments Kathy! Happy Healthy Cooking! 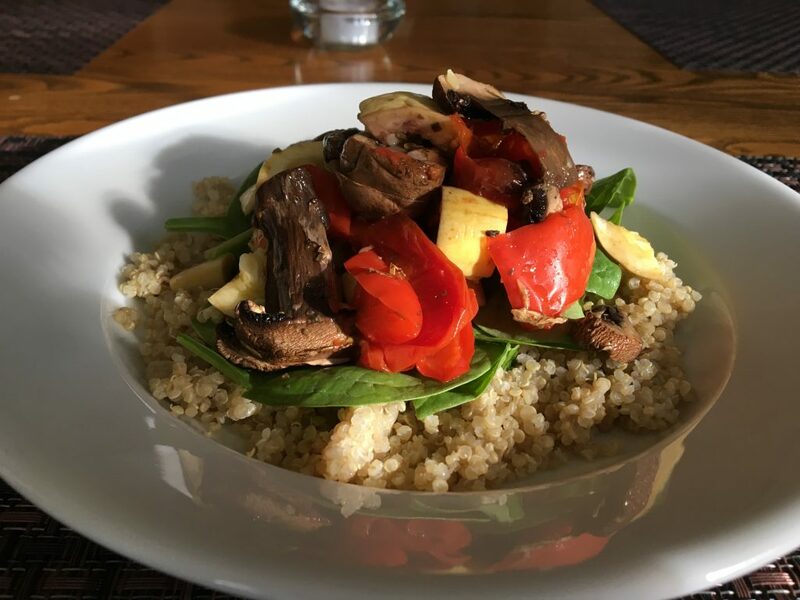 Hi Tami, I’m brand new to plant based eating and it’s such a steep learning curve.. I’m spending heaps of time researching recipes and experimenting with new things. This is a great post. I can’t wait to try Donna’s sauce but do you cook the potatoes and carrots with skin on or peel them first? Hi Amanda and welcome to the plant world! You are so right it is a steep learning curve but it is so worth the effort. The pay off is tremendous. If I am using a Yukon gold potato I leave the skin on but its any other kind of potato I peel it. I peel my carrots – but that is just me. 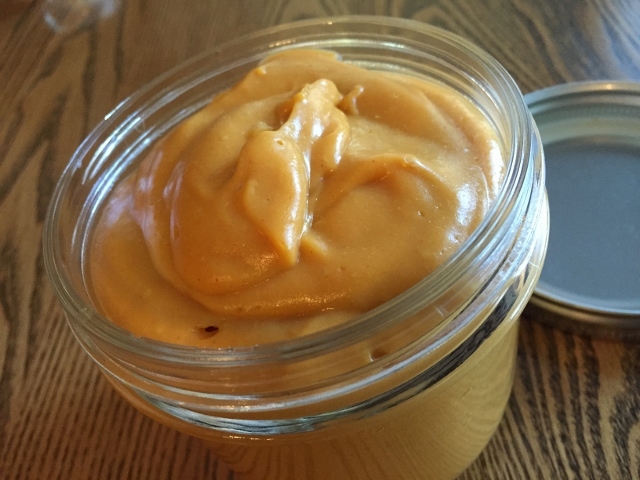 It is a really good cheeze sauce – I hope you enjoy it.